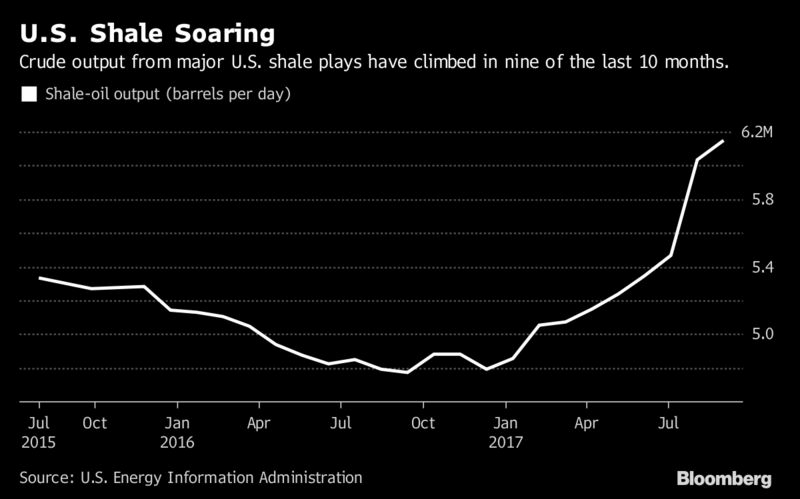 Shale drillers such as Pioneer Natural Resources Co. and Devon Energy Corp. have been taking advantage of price rallies near $50 a barrel to hedge their output for next year and beyond, with some producers locking in prices as far out as 2023, according to data compiled by Bloomberg. The EIA expanded its monthly forecasts to include the Anadarko shale region, which spans 24 Oklahoma and five Texas counties. The region, a well-established oil and gas producing area, has seen an uptick in improved drilling and completion technology, the agency said in its monthly Drilling Productivity report released Monday. The agency also made another change to reflect shifts in oil and gas production: The EIA consolidated data from the Marcellus and Utica areas, known for their natural gas production, and classified it as a single Appalachia region. "Combining the relatively small number of active rigs across the broader Appalachia region should improve the precision of our productivity estimates," the EIA said, noting that drilling patterns no longer align with previous regional definitions. Crude output from the Eagle Ford and Bakken regions are also expected to rise in September, with Eagle Ford projected to produce 1.39 million barrels a day and Bakken forecast to produce 1.05 million. Daily output in the newly included Anadarko region is poised to reach 459,000 barrels.